Michelle, so pretty! LOVE your cards. Thanks for helping me "learn" how to use this kit.... I was kind of worried, but you have helped out immensely! Love the colors you used in the backgrounds! Lovely cards! You've shown how this kit can create very different scenes & I look forward to making my own creations with it. Oooh! You have created such pretty cards with this release! Thank you for sharing! These are both simply stunning! 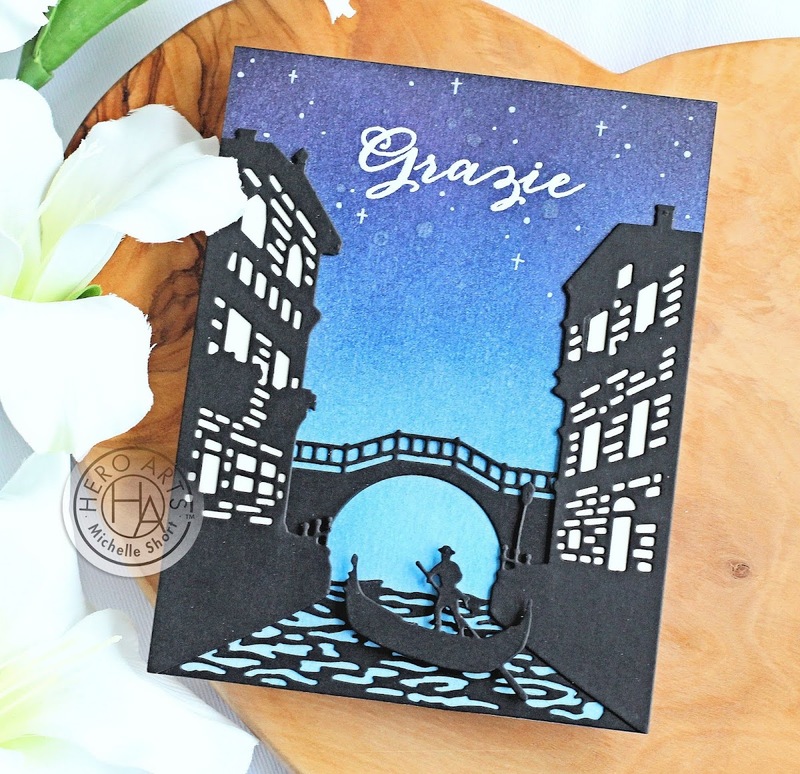 I've already admired the second card on the Hero Arts blog a few days ago, still LOVING it, and how GORGEOUS is your first card with the black silhouette city. Thank you for the wonderful inspiration! Your cards are stunning! Both scenes are beautiful! I love the night sky in the first one and the sunset in the second one! Two great cards from what looks like an amazing kit and an ultra amazing value. Your countdown card was my fave Michelle - gorgeous CAS! Great card! I love distress coloring. That sunset sky with the white silhouettes... it's too much! What a creative concept and a fabulous kit. This kit is amazing... even done CAS with pretty backgrounds it's FABULOUS!! Love that you showed us that!! Your skies look great. So colorful and pretty. Nice job. Such fun cards. I can't wait to try making a few. Thank you for sharing your ideas. Your cards are breathtaking! So beautiful! Gorgeous cards! Such nice colors. This is an amazing kit and I love your cards. My daughter was in Venice for a semester years back and this brings back memories. Superb cards!! LOVE this kit! Beautiful cards and such a fun, unique kit! Thanks for sharing your ideas with us!! Your ink blending is really beautiful, Michelle! Gorgeous cards!!! 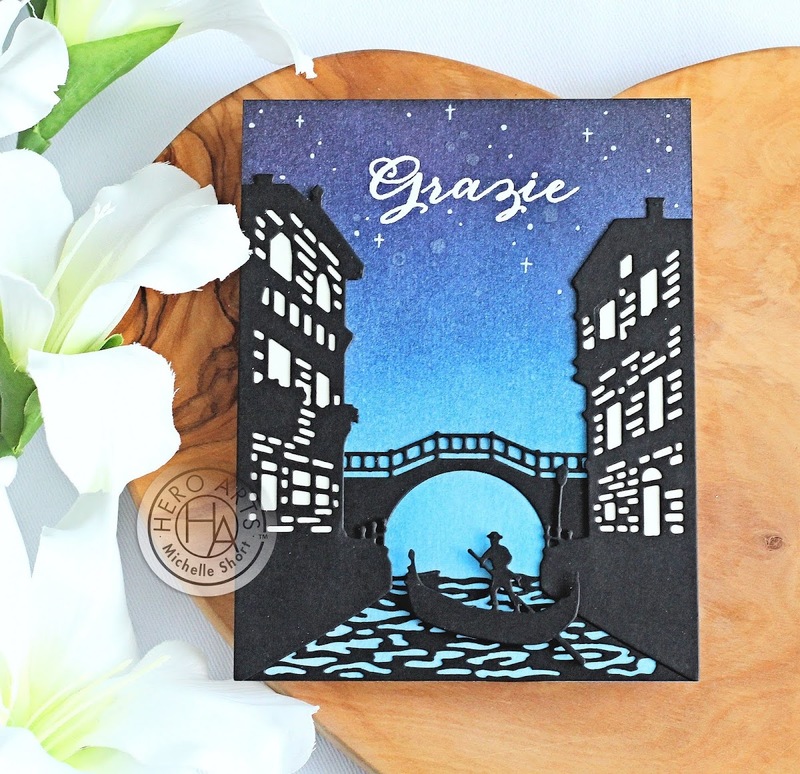 Beautiful cards and usually not being a great die fan I love these venice ones. Loving the night and day contrast. Good job, both cards are supper. Thanks for sharing. I love both the day and night cards. The night sky is so beautiful! The morning sunrise on the second card is so inviting. 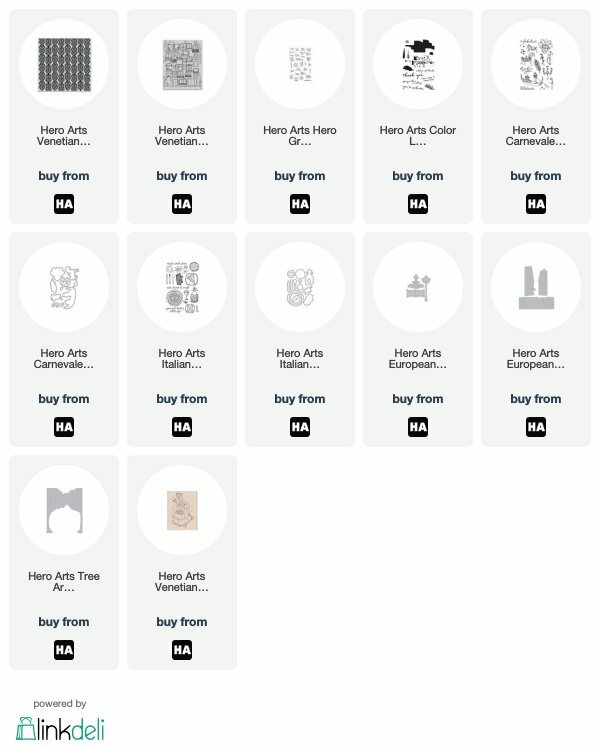 I would love to receive any one of these cards! I thought MERCY when I saw your black silhouette buildings on the dark sky. 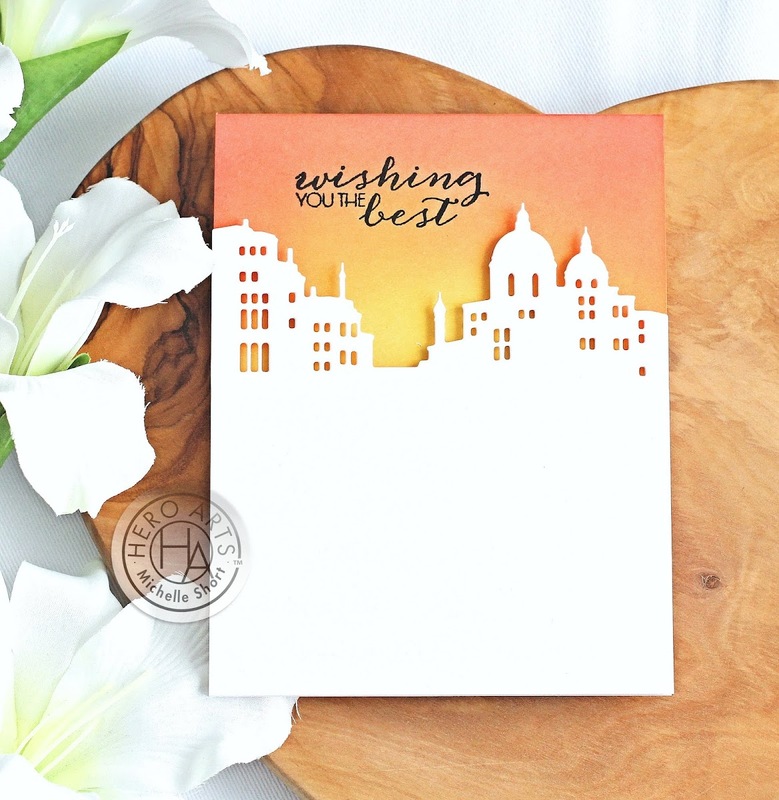 scrolling, reading, scrolling.....Then SWOON, over the desert scene with the white die cut buildings! LOVE! Simple and beautiful! Beautiful cards and I really like the second card with the stark white building. Thanks for sharing your cards. This month's kit and your cards are fabulous! Lovely cards! I love the night scene - such a beautiful sky! 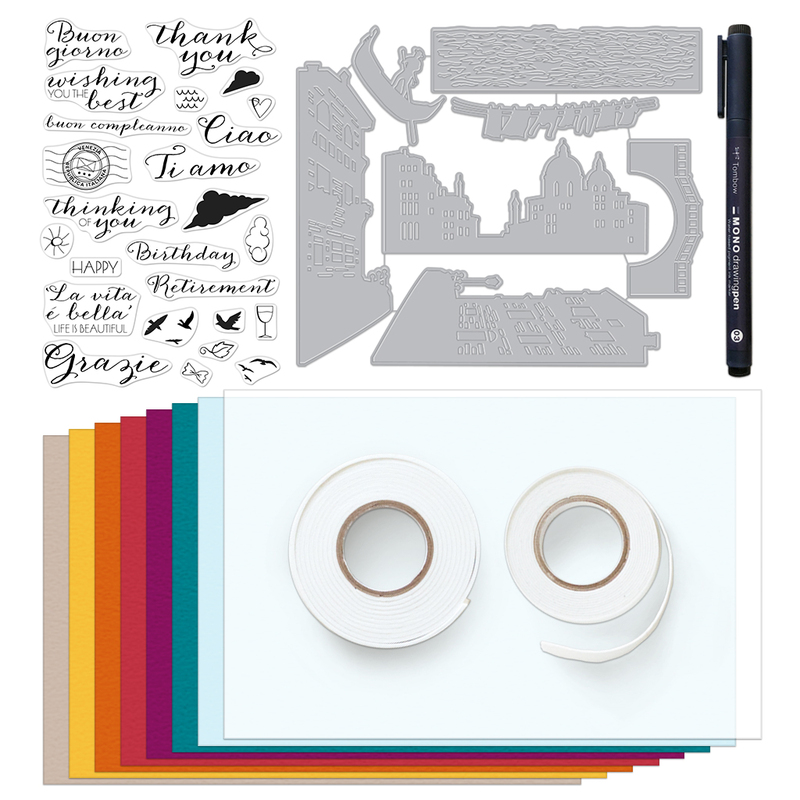 Love the choice to go with black and white die cuts! I like the idea of using black for the water with color behind it. Beautiful cards! I like the idea of using black for the water with the color behind it. Beautiful cards! Beautiful backgrounds! thanks for the inspiration!